TV personality, blogger and new Mom, Stuart Brazell walks us through the importance of authenticity and creativity while building your personal brand and her journey to becoming an influencer.&nbsp; Stuart shares the story of her recent birth to her son Asher and gives us insight into her life as a new mom juggling a thriving career. How do you know when labor is starting?&nbsp; What is the difference between Braxton-Hicks and labor contractions? When do you call the doula?&nbsp; Birth practitioner?&nbsp; Long time midwife Aleksandra Evanguelidi shares her expert perspective on identifying the signs and symptoms of pre and early labor and some practical tips for what to do during these phases. Erica Ciccone Clancy is back to share her home birth experience. After months of preparation, education, and building a solid birth team, Erica quickly progresses into active labor.&nbsp; Tune in for an entertaining and inspiring listen as she walks us through the details of her wild ride. TV producer, native New Yorker, and former competitive gymnast Erica Ciccone Clancy is imminently due with her first baby and is planning a home birth. Erica is bringing the 'mind over body' training from her gymnastics competition training, embracing the "pain as progress" attitude for labor and using TV producer experience, such as providing craft services to keep her birth team nourished and focused while she brings her baby into the world. *Note: this episode contains adult language. After transporting to the hospital for intense back labor during her first birth, actress Emilie De Ravin planned for a home birth with her second hoping and praying that the back labor would not plague her again. In this episode, Emilie, her midwife Blyss Young, and new baby Theodore walk us through her recent second birth experience. Dr. Molly Jarchow is a naturopathic doctor and midwife specializing in women's health and pediatric care. She explains what naturopathic medicine is, what the training and treatments are like and who can benefit from it most. She is passionate about holistic healing, the importance of "Whole person medicine", the 4th trimester, and educating women about their health options in general, but especially before, during and after pregnancy. Actor, doula, and entrepreneur Carson Meyer draws on her Meisner Technique acting training to make herself more fully present with her doula clients specific emotional and physical needs. There is no "script" for birth, each experience has its different challenges, joys, and outcomes. Aussie actress Claire Holt gets candid about her upbringing, her path to a successful acting career, meeting her husband and their first pregnancy which ended in a miscarriage that took them by surprise. Claire's warmth and authenticity are felt throughout the podcast as she talks about the importance of supporting people who have experienced miscarriage and the excitement she now feels for the new life she is bringing into the world with her upcoming birth. Herbalist and vaginal steaming guru Nicole Sessions discusses the art and benefits of vaginal steaming. Our Steam Queen talks about common misconceptions surrounding periods, pain, cleansing, self-care, and healing and explains why steaming your undercarriage can be beneficial regardless of gender. Nicole gives us tips and tricks on how to steam, what herbs to use and avoid, and the best time and place to steam for maximum benefit. Dr. Berlin teams up with the hosts of Dr. Stus Podcast (Dr Stuart Fischbein and Midwife Blyss Young) to interview the subjects of the documentary birth film ‘These Are My Hours’ the story of a single birth from start to finish. This intimate documentary is an immersive look into one woman's physical, psychological, emotional and spiritual experience of giving birth. ‘These Are My Hours’ is a story of transformation, celebrating womanhood and honoring our species oldest ritual: giving birth. Dr. Donna Lieu and her obstetrician Dr. Barry Brock discuss, Donna’s two breech babies, the first a cesarean breech birth and the second a vaginal breech birth after cesarean. Her contrasted birth stories highlight birth options that may be available despite the orientation of the baby. Dr. Brock shares his insight into the disappearing art of vaginal breech delivery and vaginal birth after cesarean as well as some of the pros and cons of each and safety factors to consider. This two topic information packed episode starts with family medicine physician Dr. Stephanie Canale discussing the interesting field of family medicine. After the break, Dr. Canale shares the personal struggle that she experienced with infant nutrition that led her to create ‘Lactation Lab’, a service that tests for nutritional content and toxicity in breastmilk. Lactation Lab is an informed pregnancy sponsor. Sharkeith Franks, a business and finance expert and founder of 9Nth Level consulting group gives us the inside scoop on starting and running your own business. Sharkeith shares her tips for accounting, taxes, inventory, payroll and much more. Author JK COY shares her birth journey including how and why she inspires women to have a more positive birth experience in her latest book "Because You Are Superwoman: how to harness your superpower and create your own positive birth experience with minimal medical intervention". Actress Alexie Gilmore, a stepmom to three kids, is expecting and due any minute. 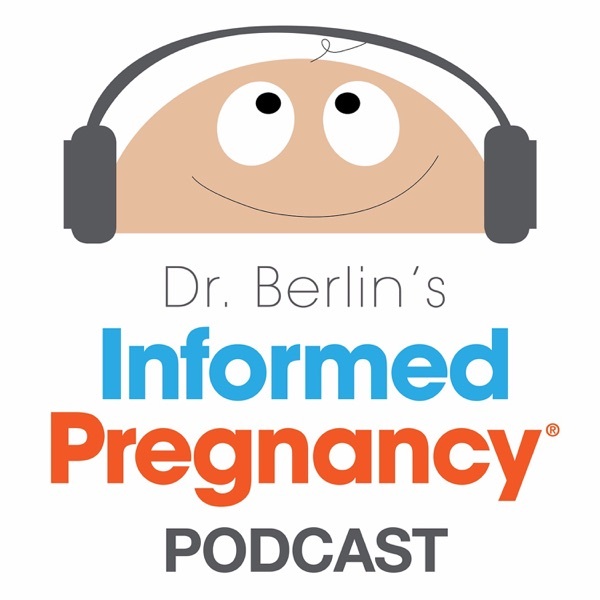 After watching and celebrating pregnancy, birth, and parenting of her closest friends, they now turn the tables to offer blessings and advice and a few surprises from Dr. Berlin. *Note: Adult Conversation and Language* Yael Cohen Braun is the founder and CEO of 'F*ck Cancer', a nonprofit dedicated to early detection, prevention and garnering support for people affected by cancer. After birthing her first child she launched the judgment-free digital media community ‘Motherlucker’ and now, with two boys, she and her husband Scooter are expecting a baby girl. Join us for candid discussions about life and how we can better support one another through the more difficult times. Nearly due with her second baby, actress Emilie de Ravin (Roswell, Lost, Once Upon A Time) stops for an informative and entertaining chat about pregnancy, childbirth, and motherhood. Learn how easy, fun and beneficial it can be to do aerial yoga as we chat with aerial performers Kimberely Simonetti and Katie Sole. Kimberely created and Katie is a certified instructor in Up Flying Yoga™ and Up Fly Aerial Dance™. Can a forty-year-old virgin who hasn't done IVF really be in her third trimester of pregnancy? Childbirth educator doula and soon-to-be mom joins us to talk about the options, process, and experience of embryo adoption as well as her plans for childbirth and motherhood. Part two of our interview with Kat Von D and Leafar Seyer is a candid talk about their relationship, pregnancy, and planning for labor, birth and beyond. Co-Host: Nicole Sessions. Kat Von D and Leafar Seyer stop by the Informed Pregnancy studio. In part one of this two-part series, they discuss intimate and interesting details of each of their backgrounds and upbringings and how they met and fell in love. Part two is a candid talk about pregnancy and planning for labor, delivery and beyond. Co-Host: Nicole Sessions. Celebrity health coach, holistic nutritionist and wellness expert Kelly Leveque combines her passion for health and the science of nutrition with a practical and optimistic approach to help her clients and readers improve their health, achieve their goals and develop sustainable habits to live a healthy and balanced life. She has a long list of clients among the Hollywood elite and she is the best selling author of ‘Body Love’. What is truly different about pregnancy in your late 30's, 40's and beyond? OBGYN and perinatologist Dr. Emiliano Chavira talks about practical considerations for pregnancy and childbirth over 35. Spoiler Alert: Its not all that different than pregnancy before 35. In addition to hospital birth and home birth, there is the growing option to give birth at out-of-hospital birth centers. Birth center midwife Hayley Oakes shares details about the birth center setting and what its like to be under the care of birth center midwives for pregnancy, labor and delivery, and postpartum. We also discuss pros and cons of birth center in relation to both hospital birth and home birth. Listen through to the end for a sweet surprise! Women's Business Coach Heidi Stevens is passionate about empowering and inspiring other women business owners to be the best versions of themselves. Tune in to hear her share some of the tools and strategies that she used to grow a multi-seven figure business and helps to do the same for Creative Women Entrepreneurs. Learn about the foundations of Yoga and Meditation and how to maximize their benefits during pregnancy and postpartum with our guest Patti Quintero - founder of 'Uma Mother' which specializes in mindful living from Conception into Motherhood. There is an alarming disparity in US maternal and fetal health and outcomes by race with the most sizable gap being between white and black mothers and babies. Midwife Debbie Allen talks with Dr. Berlin about the depth of the issue, probable causes and contributing factors and possible solutions. Some people feel safer and more comfortable laboring and birthing in hospitals and others feel better at home or in a birthing center. Dr. Emiliano Chavira weighs in with his thoughts of pros and cons of each setting and who might be a better or worse candidate for in or out of hospital birth. Ellie Knaus is a recovering actor who celebrates and commiserates with world class experts, best-selling authors, and listeners around the world on the Atomic Moms podcast. In our interview she shares her adventures in childhood and motherhood in her raw and naturally hilarious style. Emphasizing the importance of a flexible birth plan, circumstances at the end of Jackie's pregnancy lead her to a very different birth than she was planning. In this episode Jackie shares her last minute twists, the choices she had and the ones she made and describes how the experience felt physically and emotionally in her real and animated informative and entertaining style. Broadway and television actress Jackie Seiden talks shop, pregnancy and plans for her upcoming birth - and beyond. Part I of a two part series. Richard Pass, RN, BS and his staff at 'Save A Little Life' provide specialized courses for expectant and recently delivered parents, family members and care providers on hope to prepare a safe home for infants and toddlers. In this episode he shares invaluable information about CPR, First Aid and other life saving skills. Sponsored by: KABRITA. Kabrita goat milk foods and formula are naturally easy to digest and non-GMO. To see if Kabrita is right for your family, order you trial kit at KabritaUSA.com From NBA dancer to dancing for fitness, celebrity trainer Sara Haley shares practical tips on pre and postnatal fitness and how to maximize results safely at each stage. Check out some of her free workouts at http://freepregnancyworkouts.com and important video on core exercises at http://pregnancycoreexercises.com. Reproductive endocrinologist Dr. Shahin Ghadir shares his expertise on causes of infertility and guides us through male and female fertility testing and treatment options. We also discuss fertility preservation - who should do it, when to do it and the steps involved from start to finish. While overuse of medical interventions may do more harm than good, there are times when interventions, such as medical induction or augmentation of labor can be a necessary, safe and effective tool for preventing risk. Dr. Allison Hill discusses indications (and non indications) for labor induction as well as the different methods of induction and some of the pros and cons of each. Financial Wellness Coach Portia Jackson shares tips to help growing families take the necessary steps and utilize the best tools for getting financially fit for the short term and the long haul. 20 Year fitness veteran Desi Bartlett is dedicated to helping moms get and stay fit. In this episode she shares practical tips for a healthy mind and body during pregnancy and postpartum. Learn invaluable tips on preparing for twins and multiples with seasoned expert Sue Darrison. Share this episode with anyone you know who is expecting twins and multiples! Board Certified Hypnotherapist Alisha Tamburri has over 35 years experience and has trained thousands of expecting parents and childbirth professionals in HypnoBirthing. Learn about stress management, how to release fear, emotional freedom technique, the power of language, HypnoMothering and more. Sponsored by: Simply Breastfeeding! Learn the fundamentals of breastfeeding online anytime at your own pace. Check out Simply Breastfeeding today. Cloth diapering has many benefits and is gaining popularity. Expert Renee Kennedy Powers simplifies the myriad of cloth diapering options explaining the pros and cons of each choice and how to use them properly. Sponsored by: KABRITA. Kabrita goat milk foods and formula are naturally easy to digest and non-GMO. To see if Kabrita is right for your family, order you trial kit at KabritaUSA.com Is baby wearing right for you? How do you choose the right carrier for and ensure that you are using it properly? Laura Brown founded one of the largest baby wearing non profit organizations, trains other birth and postpartum professionals, and travels and speaks nationally about baby carriers and their use. Sponsored by Lovevery - Jessica Rolph, a founding partner of Happy Family Brands and mother of three is passionate about helping parents make the most out of their children's first 1000 days. She is the co-founder of a new child development company researching and developing unique products appropriate for each stage of development and discusses parenting with intent. Sponsored by: Earth Mama Organics Grounded in Nature, Powered by Love™ Earth Mama makes effective, organic and natural herbal care for the whole journey of motherhood: pregnancy, postpartum, breastfeeding and baby care. Heather's research has led her to Dr. Emiliano Chavira who does not immediately rule out the possibility of a vaginal breech after cesarean. Heather and Dr. Chavira walk us through the options presented to Heather, the decisions that she made and how the birth ultimately played out. Sponsored by: Earth Mama Organics Grounded in Nature, Powered by Love™ Earth Mama makes effective, organic and natural herbal care for the whole journey of motherhood: pregnancy, postpartum, breastfeeding and baby care. Meet Heather: she is pregnant and imminently due with her second baby. She has had her heart and mind set on VBAC but her baby is in a breech presentation and all options to help the baby turn have been exhausted with no luck. Is repeat cesarean her only option? Sponsored by: Earth Mama Organics Grounded in Nature, Powered by Love™ Earth Mama makes effective, organic and natural herbal care for the whole journey of motherhood: pregnancy, postpartum, breastfeeding and baby care. With over 35 years experience as a board certified lactation consultant Linda Hanna IBCLC shares her wealth of experience, information and practical tips to help new and expecting moms get prepared for feeding their newborns. Sponsored by: Earth Mama Organics Grounded in Nature, Powered by Love™ Earth Mama makes effective, organic and natural herbal care for the whole journey of motherhood: pregnancy, postpartum, breastfeeding and baby care. Marisa is back and her baby has arrived. In this AFTER episode she walks us through her planned hospital birth after cesarean. Sponsored by: Earth Mama Organics Grounded in Nature, Powered by Love™ Earth Mama makes effective, organic and natural herbal care for the whole journey of motherhood: pregnancy, postpartum, breastfeeding and baby care. Eco Friendly Florist Marisa Ringe is nearly due with her second baby. As she plans for a unique Vaginal Birth After Cesarean (VBAC) she reflects on her first birth experience and then shares some of the hurdles ahead and how she is planning to overcome them. Sponsored by Naturepedic - the standard for safer, healthier organic baby and children's mattresses. Ricki Lake joins Dr. Berlin for a very candid conversation about her upbringing and personal life, the tenth anniversary of the 'Business of Being Born' and her brand new documentary film. Sponsored by Naturepedic - the standard for safer, healthier organic baby and children's mattresses. Passionate, award winning doula trainer and current president of DONA International Ana Paul Markel has trained over 1000 labor doulas including Drs. Alyssa and Elliot Berlin. In this episode Ana Paula shares her passion for labor support and wisdom about what labor doulas are (and aren't), how they are trained, their scope of practice and how to go about finding the right labor doula for you. Sponsored by Naturepedic - the standard for safer, healthier organic baby and children's mattresses. In this 'Before and After' series doula turned lawyer Shannon Maguire returns to share the finals weeks of her pregnancy and walks us through her labor and birth experience. Sponsored by Naturepedic - the standard for safer, healthier organic baby and children's mattresses. In this 'Before and After' series Dr. Berlin's interviews Shannon Maguire; a former doula turned corporate lawyer now in the final weeks of pregnancy and getting ready for her own first birth. Sponsored by: KABRITA naturally easy-to-digest non-GMO goat ilk formula. Lori Bregman, renowned doula, empowerment coach and author of, The Mindful Mom-to-Be shares tips and tools drawn from her unique background in spirituality, intuition, body/mind awareness, herbs/vitamins, aromatherapy oils, the healing power of foods, bodywork and yoga. Lori has also been featured in other magazines such as US Weekly, Allure, Women’s Health and Cosmopolitan and others. Sponsored by: KABRITA. Kabrita goat milk foods and formula are naturally easy to digest and non-GMO. To see if Kabrita is right for your family, order you trial kit at KabritaUSA.com Dr. Berlin sits down with Kabrita's Dr. Annie Salsberg, an infant nutrition expert and educator, to break down the nutritional elements found in breast milk and explain what they do. Sponsored by: KABRITA. Kabrita goat milk foods and formula are naturally easy to digest and non-GMO. To see if Kabrita is right for your family, order you trial kit at KabritaUSA.com Producer of 'When the Bough Breaks' Lindsay Lipton Gerszt, and clinical psychologist and creator of The AfterBirth Plan Dr. Alyssa Berlin join the podcast this week to discuss the vastly important, but unfortunately stigmatized topic of postpartum depression. Sponsored by: THE REAL MIDWIVES. Click here to begin watching our BRAND NEW Journey featuring Taleesha! International supermodel and jewelry designer Nicole Trunfio shares her inspiring and spiritual take on life, pregnancy and childbirth, and gives us some advice on how to approach life more optimistically. Sponsored by Travel Tray. A convenient and safe way to feed your children snacks while in the car. 'Help us save a life by reducing distracted driving!' CEO and founder of Tot Squad and Certified Child Passenger Safety Technician Jennifer Saxton, provides a highly educational discussion on proper selection, installation and safety of car seats. Sponsored by: KABRITA. Kabrita goat milk foods and formula are naturally easy to digest and non-GMO. To see if Kabrita is right for your family, order you trial kit at KabritaUSA.com Actor Mercedes Mason (Fear The Walking Dead) delivers a fun and candid interview sharing openly about her upbringing, career, marriage, pregnancy and plans for her upcoming birth. Megan B. is back in Part 2 where she discusses her amazing birth and life after having the baby. Megan is a Los Angeles based marriage and family therapist, embracing her road to motherhood. She discusses her pregnancy experience and the emotions and choices she made along the way with expert advice from midwives. Sponsored by SleepnFeed. It's the new multi-functional baby nesting system! It's both a nursing pillow and bassinet in one, great for newborns all the way up to one years old. Try it today for at home or on the go! Dr. Emiliano Chavira, an OBGYN and Maternal Fetal Medicine specialist engages in the topic of cesarean birth including how the procedure is done and how women can make the experience more birth centered rather than surgery centered. Sponsored by WONDER MOTHER. Wonder Mother has developed a dietary supplement designed especially for mothers containing nutrients formulated to meet their specific nutritional needs. It dissolves in water to form a refreshing drink! Obstetrician Dr. Jennifer Lang stops by the podcast to discuss her new book The Whole 9 Months and prenatal nutrition. She explores different topics related to cesarean birth, hypnobirthing and the importance of getting the right nutrition for yourself and your baby. Sponsored by Thrive Market. Save 25 to 50% on organic groceries delivered right to your door! Special offer - get $60 in free organic groceries + free shipping when you click here. Sponsored by Bluebird Linens. Save 30% for a limited time on the softest, most luxurious sheets! Use the promo code "berlin" to get luxury that doesn't have to be expensive when you click here. Former Miss America Shandi Finnessey shares her sweet homebirth story with her doula, former Miss Canada Nina Phelan. Sponsored by Thrive Market. Save 25 to 50% on organic groceries delivered right to your door! Special offer - get $60 in free organic groceries + free shipping when you click here. Anesthesiology Dr Mark Zakowski discusses the science, popularity and safety of various options of medicated pain relief during labor. Sponsored by Thrive Market. Save 25 to 50% on organic groceries delivered right to your door! Special offer - get $60 in free organic groceries + free shipping when you click here. Award-winning childbirth educator, celebrated speaker, and specialist in guiding audiences to revolutionary new approaches to childbirth Dr. Britta Bushnell PhD talks about blending her experience in childbirth with her doctoral study in mythology and psychology, bringing a fresh approach to an age-old human experience. Sponsored by Thrive Market. Save 25 to 50% on organic groceries delivered right to your door! Special offer - get $60 in free organic groceries + free shipping when you click here. Prenatal Chinese Medicine practitioner, lecturer and author Laura Erlich MTOM, LAc (FABORM) talks about the various modalities within Chinese Medicine, how they work, and how they are used during and after pregnancy. Sponsored by PipandGrow.com. Nap your baby safely virtually anywhere in the Next Generation Baby Bassinet. Click to learn more and use promo code INFORMED to save $10 on the Woodland Smitten. Dr. Emiliano Chavira, an OBGYN and Maternal Fetal Medicine specialist engages in an informative, practical and sensitive conversation about preterm labor. Early miscarriage is fairly common but rarely discussed. As a result many women and their partners feeling alone during what can be a sad, painful and difficult experience. October is Pregnancy and Infant Loss Awareness Month. Dr. Berlin and midwife Blyss Young sit down and open dialogue about early miscarriage with actress and doula Ashley Williams who shares her personal experience with early miscarriage. Sponsor: My1stYears - adorable personalized gifts for kids. Save 10% with promo code BERLIN Actress and doula Ashley Williams shares her two birth experiences including an episode of shoulder Dystocia - which occurs during childbirth when the head emerges, but the shoulder gets stuck and don't spontaneously come out. Our guests OB/GYN Dr. Allison Hill and Midwife Blyss Young weigh in on how they are trained to handle shoulder dystoica in the hospital and at home settings respectively.